I share the late president's opinion. 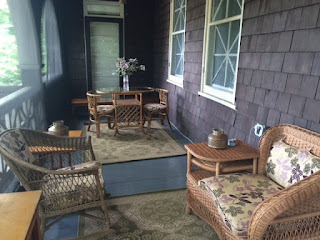 A wooden veranda measuring over 100 feet wraps four sides of the Victorian summer cottage that is my year-round home. But that wasn’t enough for the home’s first owners. 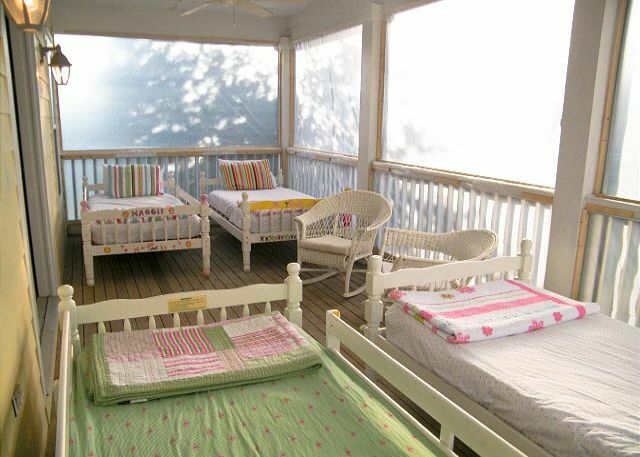 Our cottage has two second-floor sleeping porches that each connect to inside bedrooms. And on the third floor, there are the remnants of two tiny, unsheltered porches, the victims of almost 120 years of wind and rain. It’s a pretty tall house, and I imagine the perils that faced the early porch builders. I’m so grateful for their efforts. The porches are the house’s defining feature from the exterior, and the center of happy, summer solitude. 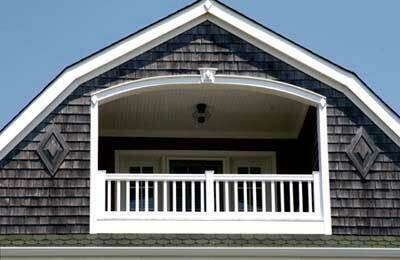 In India and other warm countries, porches are usually called by the president's chosen word: veranda. The etymology goes back to the Portuguese word “varanda,” meaning railing or balustrade. When the British followed the Portuguese in the colonization of India, they learned “verandaa” as a Hindi language word and added an ‘h’ when they fitted their own “verandahs” onto sprawling bungalows. Of course, Indians were well acquainted with outdoor home design. In very old times, rajahs and nawabs sat in state on their elaborate courtyards when receiving visitors and addressing the concerns of their subjects. Rooftop sleeping is still common in India, and ground-floor verandas are a popular place for visiting with friends and dealing with merchants. 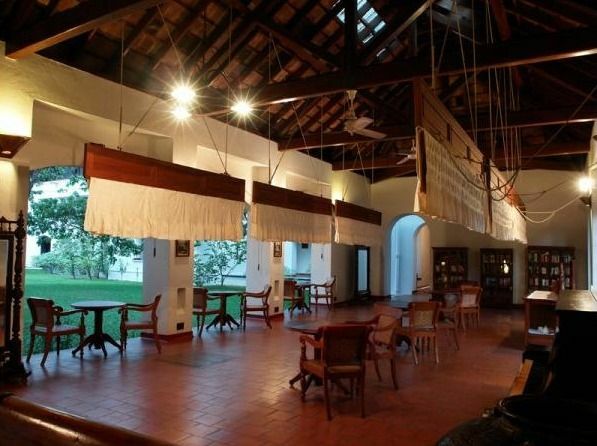 Indian heritage hotels have great verandas, such as Brunton Boatyard, where I’ve stayed several times and always found it a treat to sit on the ground floor veranda reading the newspaper. After seeing the photo above of a colonial hill station bungalow, I’ve become interested in visiting Verandah in the Forest, located in Mataran, a few hours from Mumbai. I've mostly walked verandas in India that are made of marble or red oxide. I'm intrigued by this encaustic tile floor and furniture that are often hallmarks of grand Bombay design. And what fancywork on the railings! At the turning of the 19th to early 20th century, doctors from Europe to the Americas and Asia believed fresh air was believed a good counteraction to disease. Anyone who could afford it fled the heart of the city to expansive living in new colonies and suburbs. Almost all the houses in North Baltimore were built in the 1890s through the 1950s. Almost all of them have a front or back porch. Insect screens on sleeping porches once kept residents safe from mosquito-borne malaria and yellow fever. In today’s world, they’re a barrier against Zika and Dengue. Great porches are the icons of many neighborhoods throughout Baltimore City. In my student days, I loved sitting on the porch of my Charles Village rowhouse and chatting with the neighbors the next house over. Thirty years ago, most of the porches on North Calvert were painted a subdued forest green. Today, many of them follow a candy-box palette. 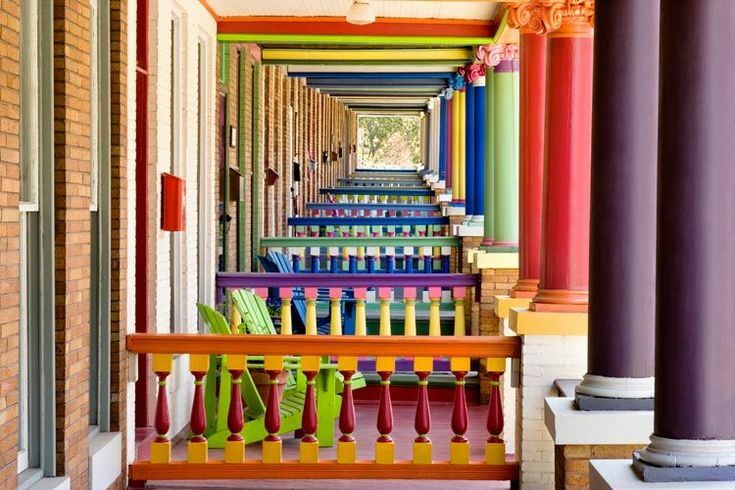 The Charles Village porches explode with color, shouting out their engagement with city life. Our downstairs wrap-around porch is a social place. We host a neighborhood happy hour party here every summer, and smaller gatherings, as long as the bugs aren't too bad. It's hardly furnished at all; just some heavy Adirondack chairs. The porches are so expansive, I can't figure out how to fill them. But the upstairs sleeping porches are smaller, intimate spaces that I can deal with. The westward-facing sleeping porch belongs to my teenage daughter and is outfitted in a bright, modern style. When she had a pair of sugar gliders, they had the run of the place. The other sleeping porch is my old-fashioned escape. Our house’s former owners called it the Sunset Porch and loved the view in early evening. This porch, like our daughter’s, was open-air, but my husband spotted a system of wooden frames that must have once held mosquito screens. An Internet search led to an online store selling ten-foot-high rolls of nylon insect screening that could be cut to fit any space. Together, we unrolled the screening and fixed it into place. We polished the original brass lantern hanging from the ceiling. I dragged an old maple desk on the porch, added a small Ikea chair, and the summer writing office was in business. And that was it, for the first year or so. Over the last few years, I’ve added ceiling fans, upholstered rattan and wicker furniture, outdoor rugs and pierced tin lanterns from India. There’s a long coffee table that can hold dessert and coffee for a small group of guests. They are allowed in at night, the porch’s most glamorous hours. 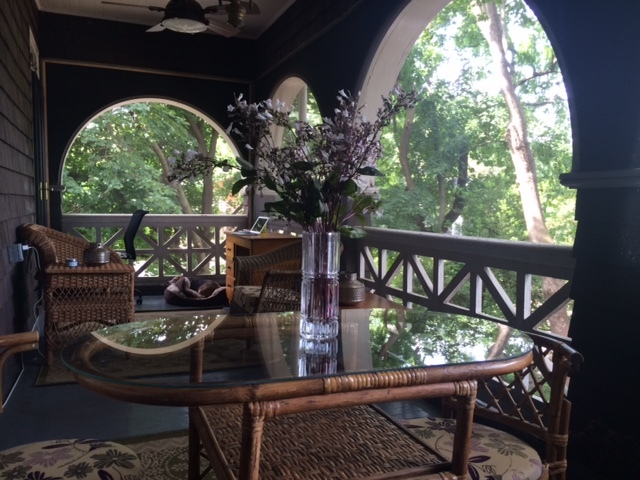 I like to think my porch is the Mid-Atlantic, late Victorian version of an Indian veranda. Although the children regard this place as their mother's writing porch, one family member considers it his room. 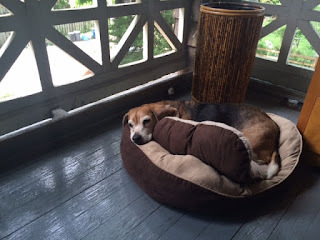 Charlie the beagle, rests in his daybed close to the writing desk, guarding me from distraction. Because our porch overlooks a small backyard lane and the neighbors’ gardens, it’s a serene environment where the loudest sounds come from nature. I can literally eavesdrop on birds and squirrels in the tall maple and black walnut trees. Ironically, my sleeping porch has so many places for sitting, I can't find room for a bed larger than Charlie's. Although, in my mind’s eye, I envision my porch one hundred and ten years ago. Four cots face eastward over the tops of young trees bordering the property. The view is mostly sky, and one can hear the bells of the long-gone streetcar on Roland Avenue, and the rolling sounds of the milkman’s wagon before the city awakens into summer heat. A truly idyllic environment in every way! You surely do know how master setting, Sujata. Oh, Sujata! How beautiful! Rather than dwell on my envy, I want to say this is one of the those moments that raise gooseflesh on this historical mystery writer. When I started to draft Strange Gods, the word "veranda" fell into my head. The first of mine showed up at my fictionalised version of the Scottish Mission outside Nairobi in 1911. I imagined it having rattan furniture that squeaked when a large person sat on it. And a table with a lace doily. And a gorgeous view. Verandas have shown up in all three of the series books I have worked on so far. NOW, thanks to you, I can see my verandas' history--even though I never understood why they were there. They came to British East Africa, as most of the officials of the Empire did, and the overwhelming majority of the policemen, from India. I purposely put a punkah fan in the District Commissioners office, calling on the Indian connection. 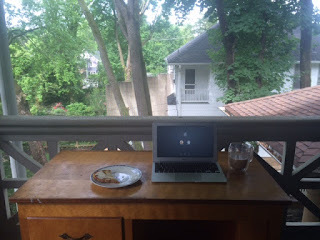 But I had no idea until you wrote this wonderful post, that the verandas came from there too. An amazing environment in which to write ... the veranda, sleeping porch, kitchen view, all lovely. I grew up in Chicago in a red-brick three-story apartment building. Off my bedroom was a sleeping porch which I reached by climbing out my window. It was a small area carved out of the brick. On hot summer nights, I would sleep out there and try to catch any breeze that might come by. The verandas are beautiful. If I get to build another house I will have at least one proper veranda. I remember riding the streetcars in Baltimore with my grandparents in the late 50's. I don't think they lasted too many years after that.